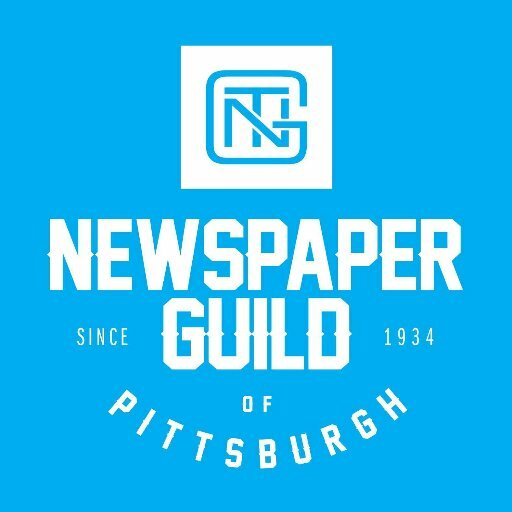 Among the outpouring of community support for the Newspaper Guild of Pittsburgh, a set of community members have created a Change.org petition fighting for a “Fair Contract for a Free PG Press”. 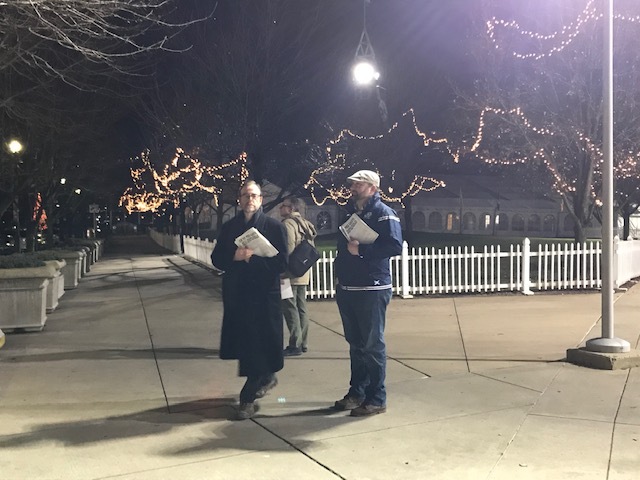 Join the over 400 strong who have already filled out the petition and send a message to Block Communication that the community supports and a fair and equitable contract for the Newspaper Guild of Pittsburgh! 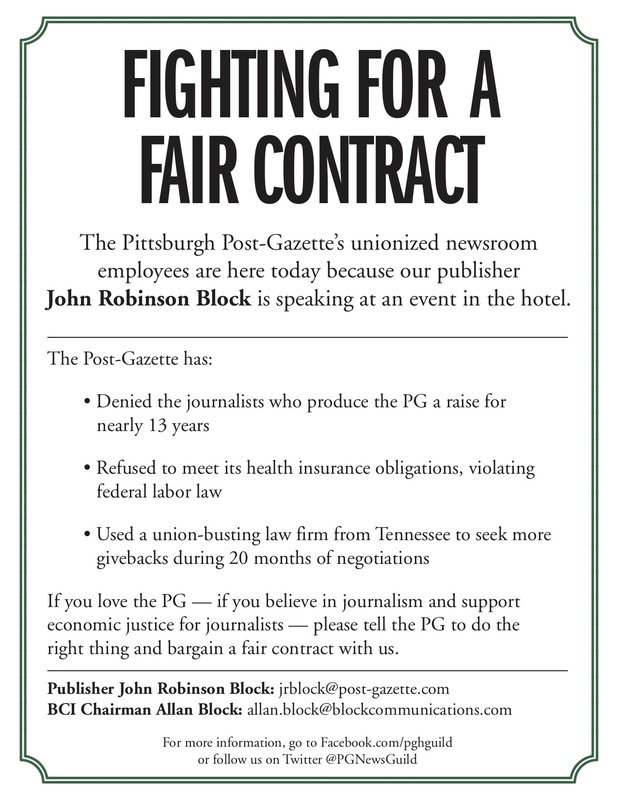 How can you help the @PGNewsGuild journalists of the @PittsburghPG achieve a fair contract? Write to our publisher JR Block! OR, BCI Chairman Allan Block! We are seeking nothing more than a fair contract. The Guild is in the 22nd month of negotiations. While we are at the bargaining table the Blocks and their hired-gun law firm have flouted the order of an administrative law judge and refused to fully fund our health insurance. 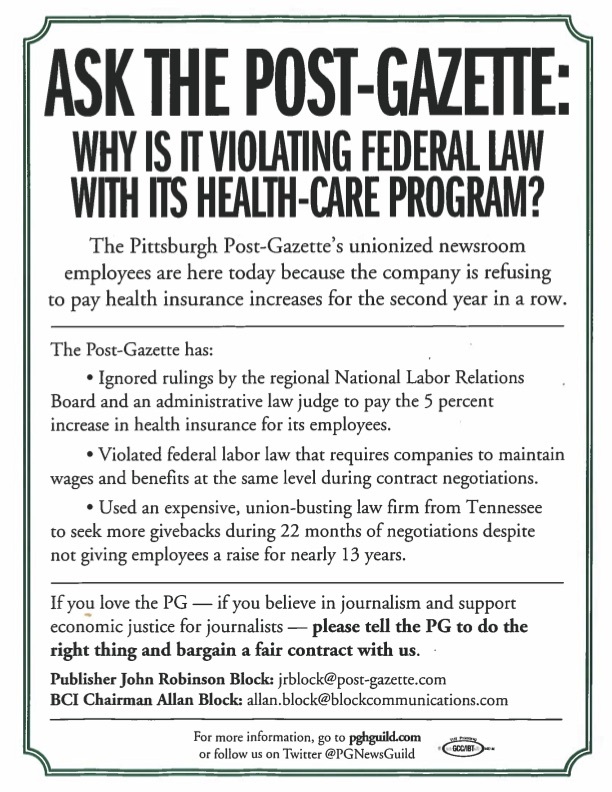 For the second consecutive week, members of the Newspaper Guild of Pittsburgh—all of them newsroom employees at the Pittsburgh Post-Gazette–distributed leaflets today, protesting 13 years without a raise and two straight years during which the company has defied federal law by refusing to pay health-care premium increases. In October, an administrative law judge agreed with the regional director of the National Labor Relations Board that the Post-Gazette violated federal law by not paying a 5% increase in the 2018 health care premium for 400 unionized employees at the newspaper. The judge ordered the company to pay the premium increase and to reimburse those adversely affected by the company’s improper decision. Instead, the PG appealed the ruling to the full NLRB in Washington, D.C. Additionally, it told the unions it will not pay another 5 percent increase set for 2019. Another NLRB Unfair Labor Practice will be filed against the company, said Michael A. Fuoco, a PG enterprise reporter and president of the 150-member Newspaper Guild. The reporters, photographers, copy editors and other newsroom employees who leafleted were also protesting a long-standing 8 percent cut in wages, 13 years without a raise, and working without a contract for 22 months with no end in sight. The PG has hired a union-busting law firm from Nashville to handle its negotiations..
“It’s time Block Communications Inc. Chairman Allan Block and his twin brother, PG Publisher John Robinson Block, start acting as ethical stewards of a 232-year-old newspaper and treat quality journalists with dignity, fairness and respect,” said Fuoco, a 34-year PG employee. “To deny us raises for 13 years and to cause our health-care benefits to be cut two years in a row is unconscionable. Last week, Guild members leafleted outside the Omni William Penn Hotel before Publisher John Robinson Block addressed a noon Rotary luncheon inside. 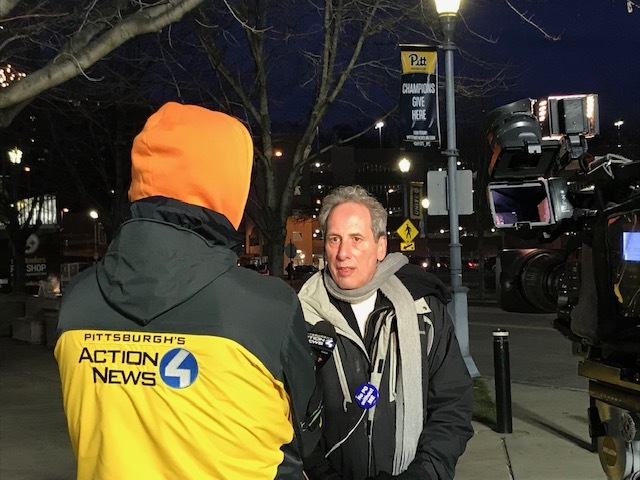 The Guild, and other unions at the Post-Gazette, have been separately negotiating for new individual contracts since the last ones expired in March 2017. 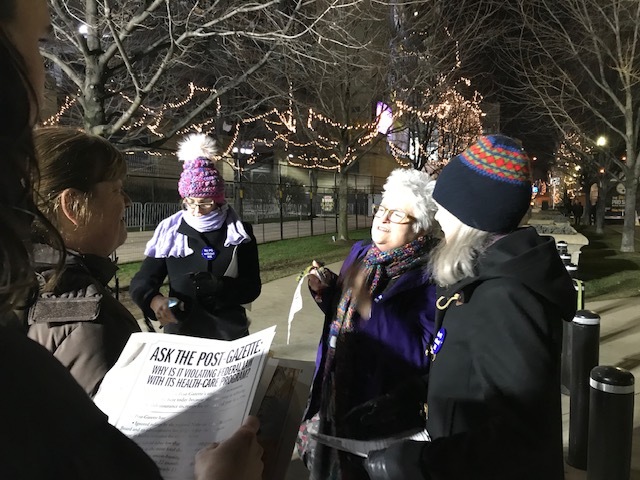 About 30 members of the Newspaper Guild of Pittsburgh—all of them newsroom employees at the Pittsburgh Post-Gazette–distributed leaflets today protesting 13 years without a raise and two straight years in which the company is defying federal law in not paying health care premium increases. Nearly 500 leaflets (please see attached) were distributed in 45 minutes outside the Omni William Penn Hotel before Publisher John Robinson Block addressed a noon Rotary luncheon inside. 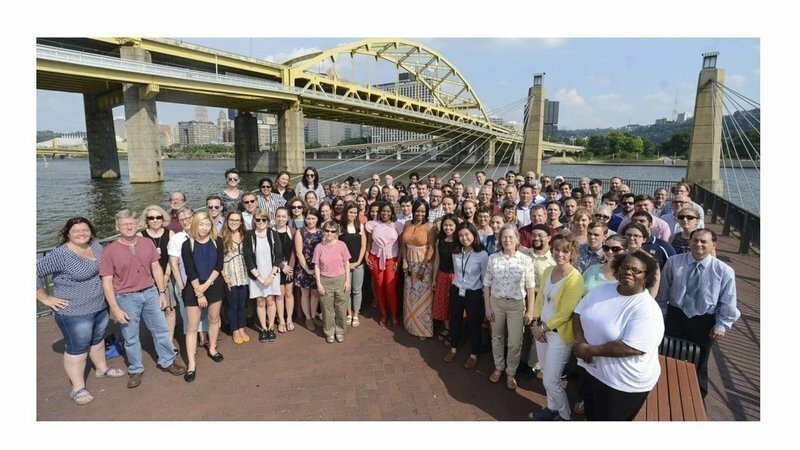 The Guild, and other unions at the Post-Gazette, have been separately negotiating for new individual contracts since the last ones expired in March 2017. The Post-Gazette, owned by BCI, has been using a union-busting law firm from Tennessee in negotiations with all the unions. “This is but the first of many planned mobilization efforts to more visibly express our displeasure with the way John Block and his twin brother, Allan Block, chairman of Toledo,Ohio-based Block Communications Inc., have treated us for 13 years,” said Michael A. Fuoco, a 35-year reporter at the paper and president of the Newspaper Guild, which represents 150 newsroom employees. “All we are asking is to be treated with the dignity and respect we’ve earned with our talent, loyalty and dedication. To deny us raises for 13 years and to cause our health care benefits to be cut two years in a row is unconscionable. They need to change and fast. “Today we put the Blocks on notice we are not going away. There will be no deaths by a thousand cuts. More and escalated protests will follow unless and until they finally do the right thing and negotiate fair and equitable contracts with loyal employees,” Fuoco said. The Newspaper Guild of Pittsburgh thanks with utmost gratitude former PG staffer Jane Elizabeth and her staff at the Raleigh (NC) News & Observer and The Herald-Sun, and the Toledo Newspaper Guild and its president, Nolan Rosenkrans, for their thoughtful donations to our staff of lunch and dinner on Sunday and Monday. In the midst of our dedicated members’ round-the-clock work covering the atrocity visited Saturday upon the Tree of Life synagogue, the gift of food arrived in our newsroom as a balm for both stomachs and souls. We salute our colleagues in Raleigh and Toledo for carrying us in their hearts, showing a generosity of spirit and reminding us that we all stand together.